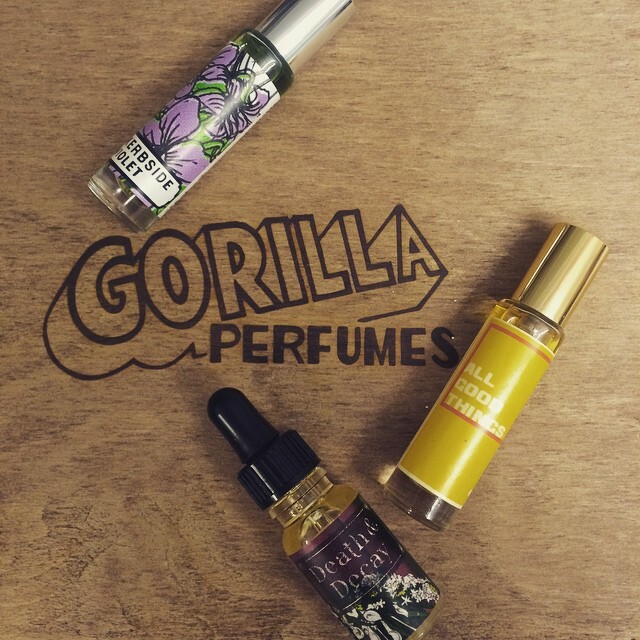 The fragrant themes explored by Gorilla Perfume have never been conventional. Let’s not forget that they are the very same people that bottled the scent of nightclubs filled with ladyboys (see Ladyboy) and mixed two polar opposing perfumes together to create something rather remarkable (see Breath of God). They do all of this with exceptional talent and remarkably good materials, AND at a reasonable price, which is no mean feat in this world of hyper-luxe dreck. It’s witchcraft, I tell you. With their third volume of fragrances, named ‘Death, Decay and Renewal’, Gorilla perfumers Mark and Simon Constantine have translated complex emotions associate with loss, whether it be the loss of a loved one or the end of a relationship, into a fascinating collection of perfumes. The three fragrances (Death and Decay, All Good Things and Kerbside Violet) in Volume 3 are not what one expects. They take the macabre and make it optimistic, and present the challenging as comforting and familiar. As always, Gorilla Perfume push the envelope in the most fascinating of ways. Be still my beating heart. Death and Decay, which sounds like it will be all about rotting corpses and fermenting flowers, is a white floral, and a bloody gorgeous one at that. Having both been “forced to face the mortality of loved ones” Gorilla perfumers, Mark and Simon Constantine have created a surprisingly serene and calming fragrance with a poignant name to meddle with our expectations. It’s quite brave to curse a beautiful fragrance with such an unpleasant name, but if Gorilla Perfume are anything, it’s adventurous. Death and Decay is all about lily, and lots of it. This is a gigantic blast of underripe lilies, singing with crisp stems, white petals and an almost banana-like freshness. A soft breeze of aldehydes hum gently through the bouquet, casting shades of Yves Saint Laurent’s divine Rive Gauche, and giving Death and Decay a classic feel. There’s some indolic funk, but not much (it’s nicely in check) and the overall feeling created by the balance between lily and indole is an old school white floral with a calm and contemplative manner. In short, Death and Decay is utterly resplendent. 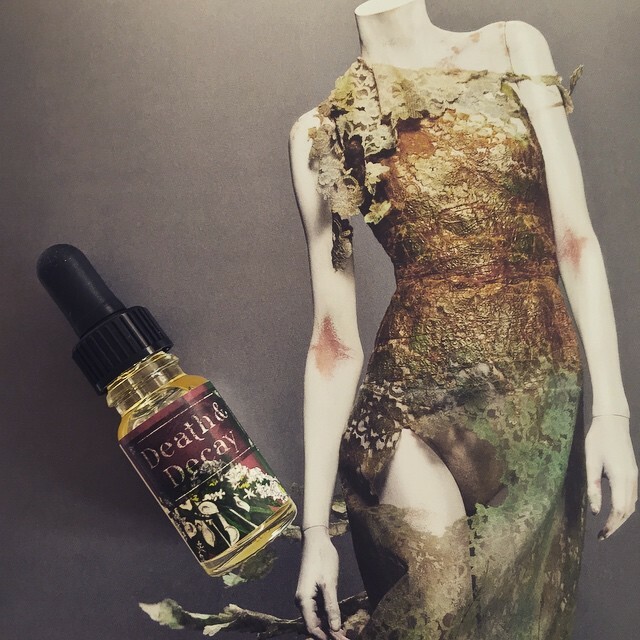 Death and Decay is available in 30ml (£30) perfume. A solid perfume (£10) is also available. I had to do a double take when reading the above quote. “Is this perfume about my life?”, I had to ask myself. But of course, not everything is about me (a fact that I often have to remind myself of) and despite the many times I have taken a drunken tumble down a flight of stairs in a cloud of sweetness, this perfume is not about me. In fact, All Good Things is inspired by a much enjoyed relationship that has come to a natural end. It attempts, with its boozy sweet notes to reflect the “cyclical nature of life” and succeeds in presenting an optimistic signature that looks out at the world and smiles, despite any hardships it may suffer. All Good Things is a big fluffy cloud of candy sweetness. Baby pink wisps of rose rise high up into the sky here, ensuring that things are sweet, floral and plush, but never cloying or overbearing. A subtle, boozy breath gives an undercurrent of rum-soaked pleasure, evoking the idea of somebody who has hit the bottle, but not too hard. This is a night of cocktails with friends type-of-fragrance, not the whisky bottle in brown paper bag kind. All Good Things dries down to a fuzzy wood base complete with spice and vanilla nuances. It’s very Lush and very good. 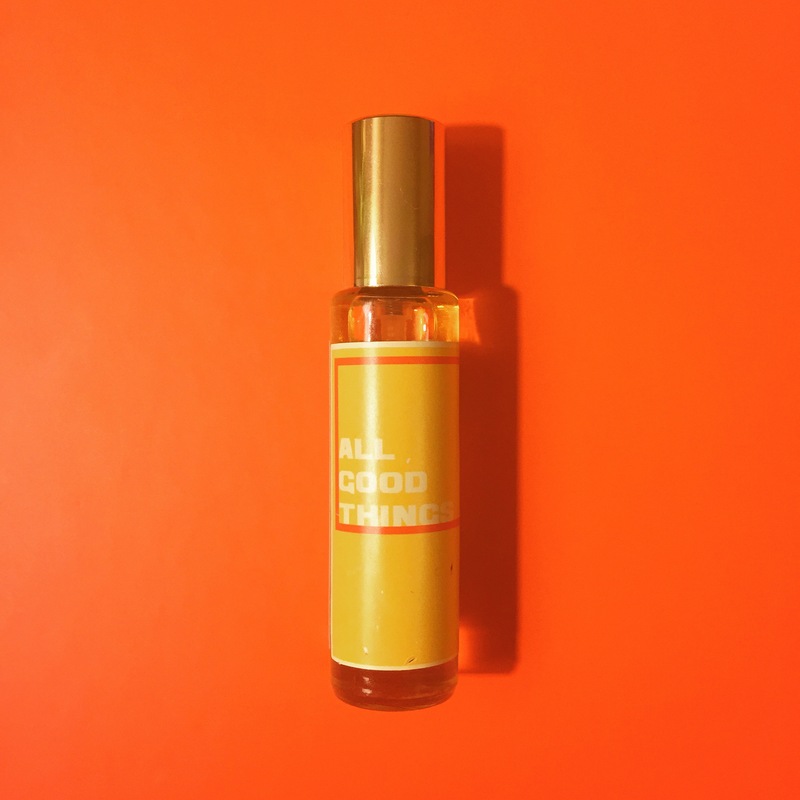 All Good Things in 10ml (£20) and 30ml (£40) perfume. A solid perfume (£10) is also available. I’ve always been partial to a bit of violet. Just check out my Guide to Violet for more details on my obsession with the note. Violet is often seen as old fashioned and dare I say, ‘grannyish’ Of course, that’s not the type of thing to put me off, and seeing as Gorilla Perfume’s very own Tuca Tuca made my guide to violet fragrances, I was very keen to try this new one. Kerbside Violet is very different from TT, it’s a thoroughly modern violet that takes inspiration from chance encounters in the street – new experiences in an urban setting told via the medium of ionones. Kerbside Violet opens sweet and green. It is instantly recognisable as violet – there’s powdery sweetness and dry earth aplenty, but what is surprising is the pop of verdant freshness that swirls around the top notes. It’s so green in fact, that it gives the impression of crisp pea pods rubbed between the fingers. In the heart, there’s a rockiness that feels like concrete, placing the violet smack bang in the cracks of that street scene, and in the end, things settle to dusty piles of mineral and earth. 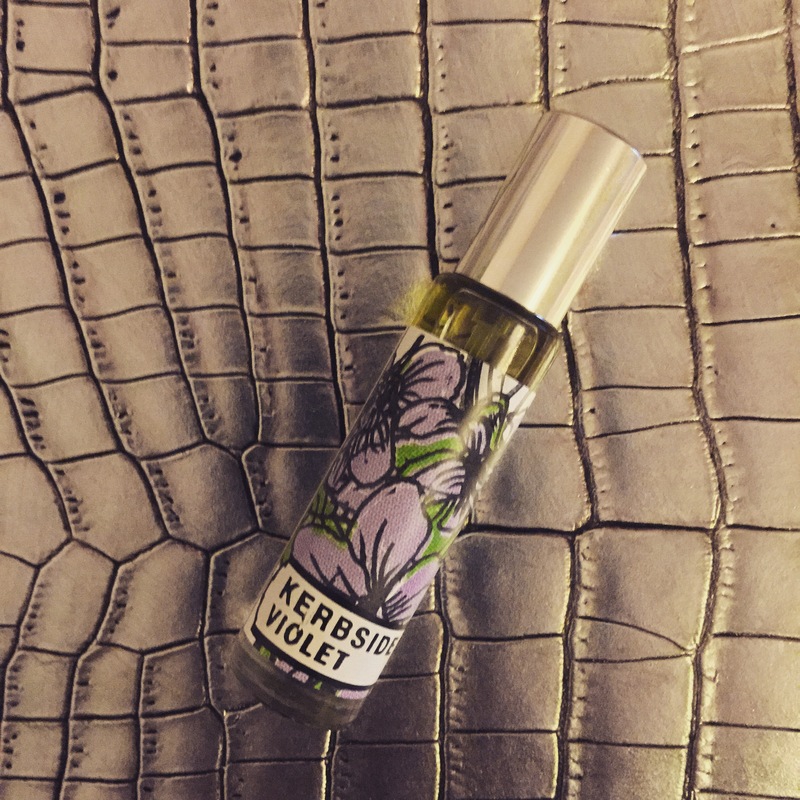 Interestingly, when I talked about this one at my Guide to Violet talk for Perfume Lovers London last year, Kerbside Violet received a muted to negative response from the crowd. I found this really quite surprising, because I think it perfectly demonstrates a clash of the old and the new in a contemporary fragrance that is as interesting to wear as it is pleasurable. It definitely gets a thumbs up from me! Kerbside Violet is available in 10ml (£18) and 30ml (£36) perfume. A solid perfume (£9) is also available. Samples, notes and quotes via Gorilla Perfume. Image 1 via Lush Plymouth. All other images are my own. Posted in Gorilla Perfume, Perfume Reviews and tagged All Good Things, Death and Decay, Death Decay and Renewal, Gorilla Perfume, Kerbside Review, Lush, Mark Constantine, Perfume Review, Simon Constantine. Bookmark the permalink. Thanks so much for these reviews! My mom and I will be visiting England for 11 days in October and I CAN’t WAIT to try these while we’re in London. In particular, and for both scent-related and symbolic reasons, I’m predicting that Death & Decay will serve as a beautiful olfactory representation of out trip. My mom and I are also very excited for the spa treatments we’re booking at the LUSH shop in Chelsea. I hope you and your mum have an awesome time in London! Death & Decay is the real stand out for me. Definitely a worthy keepsake from your trip. The spa is meant to be awesome! I see a trip to the Lush shop coming up 🙂 Hopefully it is available in Germany, too! I hope so! Do report back if you try them.